"Lis Anderson, Westbrook College, Class of 1976"
Westbrook College student Lis Anderson, Class of 1976, was a Nursing major and Day Hop. For her senior class candid photo, she wore a sleeveless sweater vest with a psychedelic patchwork pattern and beaded necklace. Her hair was blonde and wavy, parted in the middle and reached to just below her shoulders. 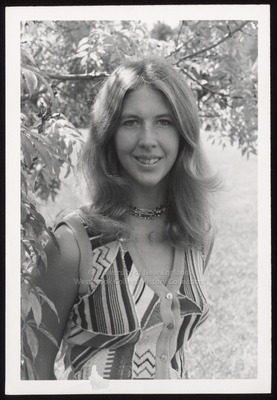 Lis stands in front of a tree branch with the sun filtering through its green leaves.